Was it a good year? Was it a dismal one? Are we tired of asking and answering this question? It’s convenient for matters of annual bookkeeping. But it’s hard to appreciate posterity. 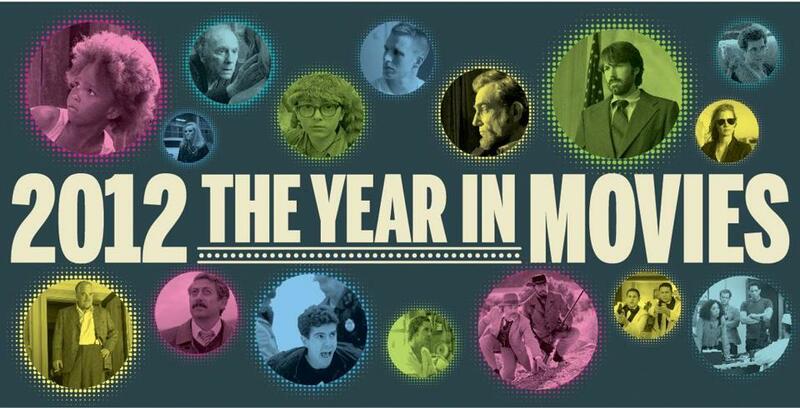 We can’t know the films that will matter in the future, and yet that crossed my mind this year: Where’s this going — not right now but, like, forever? Despite the labor that goes into creating them, movies can be completely disposable. For instance, each new shot in the space-and-sandal opera “John Carter” replaced the one before it. It wasn’t terrible enough to remember, let alone to last forever. I’m glad I mentioned it, since I’ll probably never type the words “John Carter” again. It might have helped if Edgar Rice Burroughs (the movie’s source material) wrote comic books or if the filmmakers hadn’t treated Burroughs as though he had. Indeed, once again, the biggest movies were preordained for hugeness: They were based on a comic book or a recent series of best-selling books or, in some cases, themselves. It’s tempting to laugh that “The Amazing Spider-Man” came along only five years after Sam Raimi’s trilogy ended, but even as some of us fret that the cultural life span has shrunk to nothing, it’s hard to keep laughing since that cannibalizing “Spider-Man” was a hit. It was new to somebody. Mostly, I’m afraid of the aversion to supporting a sustainable alternative. Just packing a superhero movie or other franchise with stars and great actors is to the greater good. But casting those people at the expense of putting them in non-superhero movies, casting them all in “The Avengers” and calling it a day? That’s worrying. But there’s more to the movies than hoping Mark Ruffalo and Gwyneth Paltrow can find more creatively challenging employment than “The Avengers” — a totally fun way to watch somebody spend $220 million. There were movies that cost about $20 to enthuse over, too. Take “Beasts of the Southern Wild,” the post-Katrina delta fairy tale widely considered a miracle of scrappiness and independence and community. It has as much vision as Christopher Nolan’s “The Dark Knight Rises” at a fraction of the cost. But I’m still struggling with it. I don’t think it romanticizes poverty as its detractors do. I think it manages to defuse the loaded tales and racial imagery it evokes — “Little Black Sambo,” for instance. That’s an achievement, but it’s an achievement that never filled my heart, touched my soul, or even entertained me. I stood by it — more with talking points than with passion. 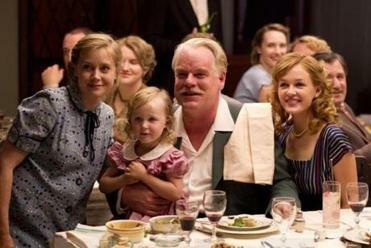 Paul Thomas Anderson’s “The Master” was the movie I loved most this year. In part I loved it defensively. It was the movie I spent the most time talking about even though only $13 million-worth of people bothered to go. Nonetheless, even people who avoided “The Master” wanted to talk about it. And those who did go wanted to argue not only with its maker but with its fans over the film’s limitations, its alleged pretensions, its emptiness. They’re all wrong. It’s a staggering achievement, and one you can point to in a time of ebbing creative Hollywood risk. Like a lot of people, I can’t believe Anderson got to make this movie, and I think that even the people who despise “The Master” are happy to argue over it. It’s a film of the future, the sort of big visionary American movie that’s all but scarce now. They’ll miss its ilk when it’s gone. It was easy to walk into Paul Thomas Anderson’s cult tower expecting something seismic to happen and feel only tremors. I don’t know what seismic constitutes: murder, disaster, some statement about our times? But this is an enormous film about a small, drifting man who meets a physically and emotionally larger man who uses his new friend to practice his spiritual ambitions. Loosely, Anderson evoked the life and times of L. Ron Hubbard, the Scientology founder, but he forgoes a social statement in favor of dual character study. The drifter thinks he wants to believe in something higher than himself but simply can’t, while the spiritualist believes he is that something higher. Anderson is the best cinematic storyteller in American movies. In two movies, he’s evolved from a freewheeling nutcase to a hulking classicist, from a young punk to a prematurely wise soul. He has a vision and, it’s rare to say this, but it might require more than viewing to see it fully. Formally, David France’s documentary is a compilation of footage from the 1980s and early 1990s as seen from the front lines of the AIDS crisis. The scenes are of what already happened among the activists — their coalition, their splintering into factions. But they don’t feel archival, per se. They feel remembered and dreamt. The years are shaped into two devastating hours of drama and anger and politics. Rather than give you foreboding before the storm or the quiet after it’s passed, France has conjured the storm itself. When adults lament that the studios no longer make movies like they used to, Lee Daniels’s trashed-up roller coaster ride must not be what they had in mind. Nobody saw it. But it’s the kind of exhilarating mess that American movies usually achieve by accident. Daniels has really thought about the mess he was making, about how inside-out you can turn a crime-thriller. The movie presents the late-’60s deep South as a cauldron of racism, psychopathology, and sexual insanity. It gives us three or four scenes that collapse eroticism and hilarity, and gets two very different but equally fierce performances from Macy Gray and Nicole Kidman. Most movie love is ideal beyond recognition. The love in Michael Haneke’s film feels inevitable. Two Parisians — Jean-Louis Trintignant and Emmanuelle Riva — who’ve spent most of their lives together reach the outer limits of their devotion once she becomes increasingly debilitated with illness. What Haneke shows you is physical — his limp, her rictus, the dance required to move her from one chair to another, his attempt to capture a pigeon. 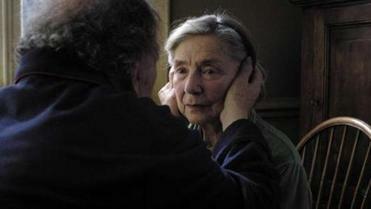 But the spare grace of Haneke’s filmmaking and magnificent stoicism of his stars achieve transcendence. Other filmmakers might have thought about how to make a genre movie about slavery — Mel Brooks, say. 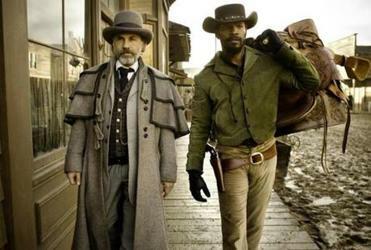 But only Quentin Tarantino would have turned that movie into a grisly romance western between two married slaves whose reunion is obstructed by a callow plantation owner and his pathologically devoted black servant (Samuel L. Jackson, high on fearlessness). Tarantino’s love of hip-hop’s use-everything philosophy and his contempt for tastefulness hit their pop stride here. Hollywood’s pious I’m-sorries and you’re-welcomes make him sick without turning him amoral. He hasn’t made the movie of a white liberal apologist. He’s made the movie of a white liberal who believes he’s a black revisionist radical. The result is far more astonishing than it is wrong. 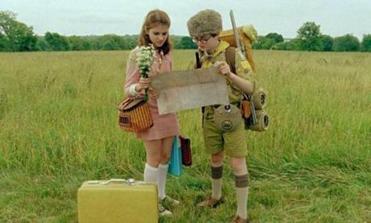 In which Wes Anderson simultaneously overcomes himself – the dioramas, the dollhouses, the disconnection from any reality — and becomes himself again. You could dismiss this film, about two runaway teenagers in love on a made-up New England isle as more indulgent folly. The indulgence resonates. This is the most exuberant movie Anderson’s made in a decade and a half. It’s as meticulously made as his other opuses. But this time that meticulousness doesn’t embalm emotion or our response to it. The melancholy he conjures doesn’t feel like a pose. In his 40s, Anderson seems ready to build his textile fetishes and pop allusions into an art that doesn’t simply speak but that speaks to us. Like “The Master,” there are many ways to understand Leos Carax’s dream of life, death, and, artistically, all that’s in between. But, really, it’s the sort of movie that works best when you let it happen to you. The amazing Denis Lavant rides around Paris in a stretch limo, emerging as a different character every time. We see him apply the transformations like an actor backstage. The film works as an allegory for both performance and reincarnation. But to make us see the higher meaning and randomness in existence, Carax appeals to our biggest and our basest desires: to see heaven, avoid hell, and see a human tongue grace the armpit of Eva Mendes. The Romanians took the year off from making great movies about life’s grueling forensics. Instead, a movie you could imagine them making came to us from Nuri Bilge Ceylan, a Turk whose mastery of atmosphere, irony, and the ebb of time are almost without peer. His fifth film is his longest, least characteristic, and most hypnotically framed. It’s a police procedural that spans a few days and nights in the Turkish hinterlands. The criminals are nincompoops, the crime grisly but elusive, and the director in sly novelistic form, fashioning grunt work with a richly comic sense of the blasé. Look, I, too, think the movies should just stop beating around the bush, get out of the business of so-called bromance, and write the bros as we already perceive them to be: gay. Until then, there was this act of confetti-gun lunacy, in which Channing Tatum and Jonah Hill try to bust up a high-school drug ring whose party product is so contagious that by the time it’s over, Tatum and Hill just seem like fun-house-mirror versions of each other.